Employees in the Ann Arbor city hall building were evacuated this afternoon after carbon monoxide built up inside much of the building and sickened at least one person. City hall was evacuated this afternoon. 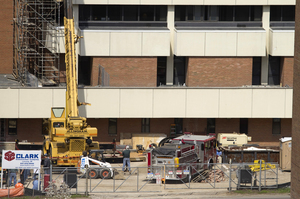 The Ann Arbor Fire Department was still on the scene around 2:20 p.m, and officials said they expected it could take several hours to bring levels back down. Officials say detectors on several floors began alerting employees earlier today of high levels of carbon monoxide in the building. One man said he wasn't feeling well and was being monitored, but he wasn't being transported to the hospital, said fire department safety officer Gretchen Virlee-Wagner. It's believed the build up was caused by a combination of exhaust from construction vehicles in the city hall construction site and the direction the wind was blowing. About 350 employees work inside the city hall building. At least 70 additional workers involved in the construction of the new police-court building also are on the site.